Meet the most terrifying villains in the Marvel Comics Universe including Thanos, Green Goblin, Ultron, Vulture, Red Skull, and more. This Reader features high-quality images from the Marvel comics. 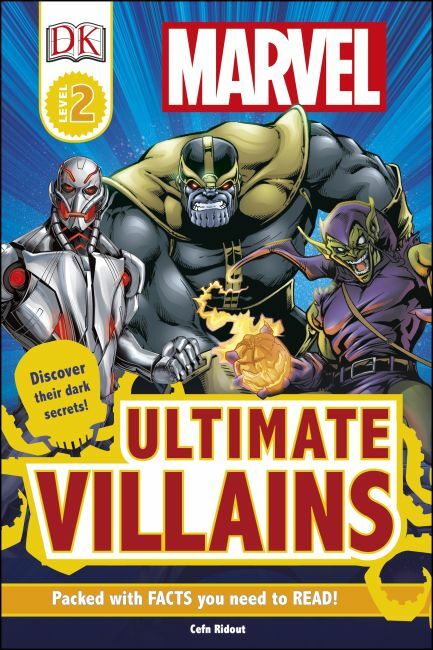 Packed with evil enemies and fearsome foes from the Marvel Comics Universe, discover their terrible plots and incredible powers. The mix of narrative spreads and interactive genre spreads encourages children to access information from a range of sources and develop comprehension skills. Perfect for 5- to 7-year-olds starting to read alone, Level 2 titles include in-depth information presented through more complex sentence structure with increasing amount of text to expand the reader's general knowledge and confidence in reading. Additional information spreads are full of extra facts, developing the topics through a range of nonfiction presentation styles, such as fliers, instructions, and record-breaker statistics.